Don’t let your customers see your keyboard, phones, or for that matter any of your other electronic office equipment. A clean office environment can have a huge impact on how people view your business. On-Site specializes in cleaning, sanitizing as well as disinfecting the “human touch” surfaces of all highly sensitive electronic equipment. Most people are truly afraid to clean these machines… and with good reason. They’re afraid they’ll short-circuit the equipment, if they try to clean it and they are right! Your Janitorial Service is not cleaning your equipment… They would rather clean a bomb than a computer or telephone. It’s just too risky for them because they are not trained to perform this service. Your Computer Technicians, Photocopier Maintenance Technicians and IT Professionals are not cleaning your equipment… they just don’t have time nor the inclination to clean the outside of your equipment. Have a look at your equipment. If YOU can see that it is dirty, don’t you think your customers, clients and staff can? What are they thinking about your business? 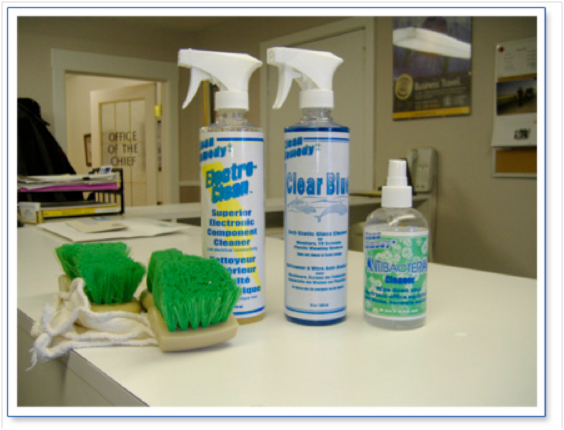 At On-Site, we “detail clean” – not just that cursory wipe that your employees or cleaning service may be doing. Our Cleaning Technicians will transform your dingy equipment to look like new! We will not only quickly restore all your electronic equipment to showroom condition, without damaging any of it, we will also disinfect the “human touch” areas, and free these surfaces from bacteria and viruses. You won’t even know we are there. We pride ourselves on “being almost invisible” so your employees and staff can carry on the work they were hired to do. We have available sufficient fully trained Cleaning Technicians on staff in order to complete the job in as short a period of time as possible. We are available to complete the contract during regular business hours, or if you prefer, on evenings and weekends. We will work around YOUR schedule and do what we can to make the job as unobtrusive as possible. For example, we will schedule our Cleaning Technicians to come to your location during your slow periods, or staff meetings or during shut down times, if applicable. LET US CLEAN YOUR DIRTIEST PIECE OF ELECTRONIC EQUIPMENT FOR FREE. Our demonstration will take no more than ten minutes of your valuable time. Fill in this form, or call us toll free at 1-888-522-5330 and we will set up a time for your free keyboard cleaning that is convenient. PS: Just for agreeing to see us, WE WILL BE BRINGING YOU A COMPLIMENTARY GIFT BASKET for your personal enjoyment (or I guess you could share!?). PPS: We only want to clean dirty equipment. I am sure you and I will agree, if you only see a slight improvement in the appearance of your equipment, you don’t need our services.